Composer Jake Heggie is not afraid to write sentimental music. Nothing else would do for such heart-tugging material as It’s a Wonderful Life. Like the beloved 1946 film by Frank Capra — an American classic — the opera starts on Christmas Eve with George Bailey about to throw himself off a bridge, only to be saved by a guardian angel who shows him how his past good deeds can save him. As a composer Heggie can set words to music with melodic lines that settle gratefully on the voice. The likes of Frederica von Stade and Joyce Di Donato have championed his songs. His musical gestures can conjure a mood or feeling with a few deft strokes. 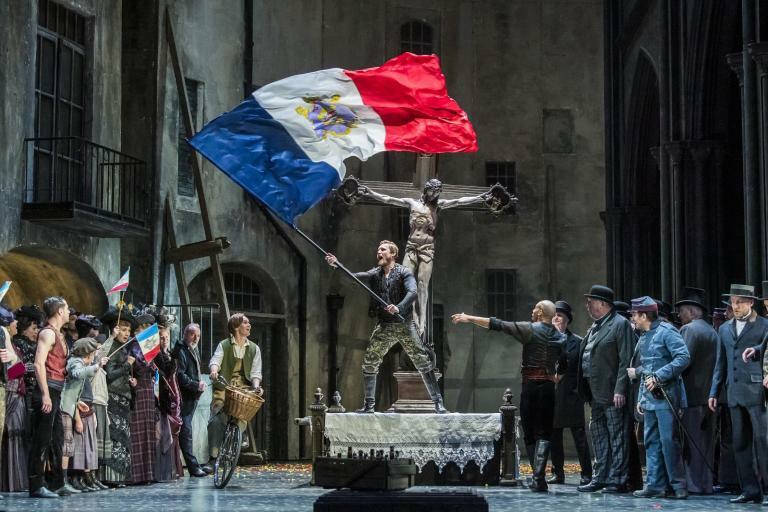 It’s not surprising that, in the opera’s West Coast premiere Saturday in the War Memorial Opera House in San Francisco, strong singing by the four principals made the most indelible impressions. Foremost was the company debut of South African soprano Golda Schultz. As George’s guardian angel Clara (the opera’s version of Clarence in the film), she sets the tone with an opening aria dripping with coloratura flair. Suspended above the stage on a swing, she counts prayers coming from the people of Bedford falls, as they offer benedictions for the distraught, suicidal George. Schultz’s supple soprano ranged from liquid, gorgeously placed high notes to a creamy midrange that soothed with its plushness. She can also act. Her Clara was a spicy angel second class’, dancing along with the human lives that play out before her. She also sassed back to the offstage amplified voice (a pre-recorded Patti LuPone) that told her what she must do to earn her wings as an ‘angel first class’. Tenor William Burden, who originated the role of George in Houston, invested the character with muscular sound that never lost its shape. As George’s wife Mary, soprano Andriana Chuchman combined a winsome look with often-ravishing passagework. Rod Gilfrey, who created the role of Mr. Potter — the evil rich guy who bedevils the good-hearted, morally-centered George — wielded a robust baritone to lend heft to his threatening existence. Several arias, scenes and duets were added after the opera’s first run in Houston. That’s an advantage for San Francisco audiences, and these additions stood out as highlights at the first of nine scheduled performances. The revisions expanded upon the romance of the young George and Mary, and enhanced a touching love scene that brings Act I to a sweet conclusion. They also added more confrontations between George and Mr. Potter, which Burden and Gilfrey voiced with intensity. There’s also an ethereal duet in which Churchman and Schultz sing separately over a disheartened George, as their ascending voices intertwine with near-Straussian richness. As an opera, however, there are caveats. We need to see how much George’s morality and generosity — as the reluctant proprietor of the family business, Bailey’s Building and Loan — have made the lives of everyone around him better. The complex plot traces why the whole town would have his back when he thinks all is lost, as happens at the end. So much exposition leaves too-little room for the kind of time-stopping expansion that is the stuff of so many memorable operatic moments. Except for brief scene-setting orchestra introductions at the top of both acts, there are no orchestral interludes, though there are certainly opportunities. Heggie seems content to use the orchestra to accompany and comment gently. Conductor Patrick Summers, as he has for all of Heggie’s previous operas, led the proceedings with appropriate pace and color, rarely missing a keen balance between the pit and the stage. There was a lot happening on that stage. Raised rectangular slabs double as tables, beds, iced-over ponds and doors. More slabs hang over the stage, ideal for projections. Clara and a quartet four winged angels (current Adler fellows Sarah Cambidge, Ashley Dixon, Amitai Pati and Christian Pursell) in silvery satin jumpsuits float above and, released from their harnesses, roam the stage like Clara’s backup singers. A vivid palette of primary colors infused the lighting — that is, until the moment when Clara grants George’s despondent wish that everyone would be better off if he had never lived. Grayscale replaces color. Music stops. With spoken dialogue, filtered through amplification, George wanders through his town, and people don’t recognize him, their lives much worse without him. George finds his singing voice to announce that he wants to live. Music and color return. This is a missed opportunity, a moment that could have been expanded into a musical peroration. The following scene, of George’s friends, family and customers rescuing him from Potter’s attempt to sink Bailey’s Building and Loan, still caught me emotionally, just as the movie does every time I see it. This revised version of the opera captures the spirit of that 1946 movie, combining frothy moments with a simple moral. As both the movie and the opera put it, ‘No man is a failure who has friends’. And opera succeeds when it has the heart, sprightliness, and voices that can deliver — with panache.